Of course, being from Game of Thrones, not every scene among these is a happy one, for the reason that the world of Westeros is brutal and bleak. And that is part of why this HBO show is so compelling. Game of Thrones returns, one last time, on April 14. HBO’s Game of Thrones ends this year with its eighth season. This show has dominated the imagination of millions of fans around the world and its conclusion is one of the biggest events in pop culture this year. That is saying something since the Marvel Cinematic Universe also ends, in a way, in the same month Game of Thrones returns. The excitement for the final season is high, and I thought it would be a great idea to reminisce and have a look at the scenes that made us fall in love with the show in the first place. 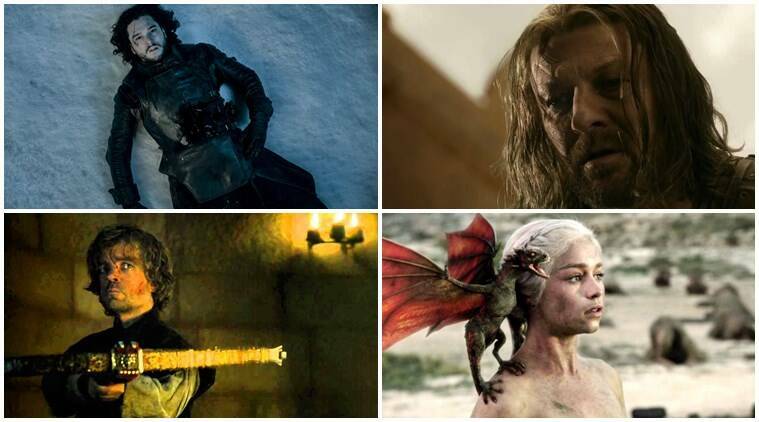 Of course, being from Game of Thrones, not every scene among these is a happy one, for the reason that the world of Westeros is brutal and bleak. And that is part of why this show is so compelling. The book readers among us knew it already, but the show made the event more tragic and shocking somehow. You see, Robb’s wife did not accompany him to the Twins (his wife was not Talisa, but that is another story) in the books. Not only did some of the most beloved characters die when the Freys, with assistance from Tywin Lannister and treachery of Roose Bolton, murdered Catelyn Tully, Robb Stark, and Robb’s direwolf Grey Wind, but Robb’s pregnant wife Talisa was stabbed — in the abdomen — in the show. While many more tragic events came in the show later, but nothing, for me at least, has managed to leave the same impact that the Red Wedding had. A handful of brothers of the Night’s Watch went to a place beyond the Wall called Hardhome to invite the wildlings stationed there to join the Jon’s fight against the White Walkers. But as they were discussing terms, the Night King invaded with his Army of the Dead and massacred nearly everyone. Some of the wildlings and brothers of the Night Watch rallied but they were too few. The episode was gorgeously shot and the visual effects were outstanding. It did not feel like a small screen production at all. The zombies, the battle choreography, the weather effects, everything was done quite perfectly. It was also the first time the de facto hero of the show, Jon Snow, fought and killed a freaking White Walker. And we discovered that Valyrian steel can shatter the White Walkers like glass — just like dragonglass. The first full scale battle in Game of Thrones occurred between Jon Snow and Ramsay Bolton. That moment when Jon stood on the ground before the charging enemies on their warhorses was incredibly thrilling in a cinematic way. The scale of the battle was absolutely humongous, and it looked even more expensive than Hardhome. The payoff, of Sansa getting her revenge on Ramsay by getting him eaten by his own hounds, was sweet too. But it was the shot of Jon standing his ground against all odds that lingers in the memory. Every sane viewer of the show wanted the Viper to win, but we all realised something was wrong. While the Red Viper was clearly the more skilled fighter, and much faster, the battle was getting stretched. The Red Viper continued to taunt the Mountain, and despite getting lots of chances, did not kill him. The Mountain was getting angrier and more frustrated. And all it took was one minor mistake. Prince Oberyn Martell of Dorne fell to the ground, and Gregor Clegane crushed his skull like a watermelon. It was not the most shocking moment of the show (that would be the Red Wedding), but it does come close. Not long after Jon Snow killed a White Walker in a fair one-on-one fight, he was assassinated by his own brothers of the Night’s Watch. There had been resentment against Jon’s decision to rehabilitate wildlings and allow them to come inside the Wall. And there were pretty valid reasons why Jon was killed (not everybody treated the wildlings as humans, for one). But his death felt like a punch in the guts all the same. Jaime Lannister, initially, was a character easy to hate. Brash, cruel, quick-tempered and a Lannister. What’s not to hate? But even as his twin and lover Cersei became more and more vile, he has become, if not good, an extremely rounded character. It was his incarceration at Riverrun and his journey to the King’s Landing with Brienne that changed him. In Harrenhal, he, intoxicated, admitted to Brienne what he had not admitted to anybody else, even his sister. That the tag of Kingslayer people have given him was unfair. He shoved his sword in the back of Aerys Targaryen to save the city. Aerys was going to burn the whole damn thing using wildfire. Tyrion Lannister, while escaping King’s Landing and justice, snuck into his father’s room and found Shae on the bed. Enraged, he strangled her. Then Tyrion went to the privy, where he found Tywin. After warning his father not to use the word ‘whore’ while talking about Shae, Tywin continued to call her that. Tyrion killed him. And the most powerful man in Westeros died just like that. Killed by his own son while sitting on the toilet seat. It was unsettling how nonchalant Tyrion was while murdering his father, however evil he had been. This duel was so lifelike and dirty that it was ludicrously easy to suspend disbelief. It really did feel like two medieval warriors were engaged in a sword fight to death. It was not honorable swordplay, but a gritty sort of fighting among two people who desperately want to kill the other person. And just like real life, anybody could have won. A lucky thrust or an unlucky slip would have turned the tide of battle — in any direction.